Show your customers you care about their vehicle by placing a floor mat in every vehicle in for service. 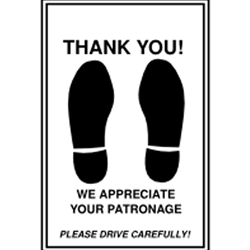 This high quality 50 pound paper imprinted with a “Thank You”message is excellent protection for the plush interior of today’s cars. Our big 17” x 22” mat covers almost 400 square inches. **Standard packaging is always 1000 per box. 500's used to fill odd quantities only. **Please use drop down box to choose between 1000 per box and 500 per box.